Foulwater Falls is a level in Wario Land: Shake It! that is located in Ratl Ruins. There is a Secret Map in this level. 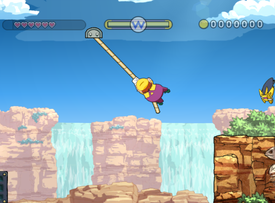 Throughout the level there are many small lakes where Wario call fall in and also has many ropes to get over it. Later in the level, the player will come up to an area with many gaps with spikes. Wario can either jump over them or also swing off ropes to cross larger gaps. There is also a gap leading to hidden treasure that Wario can only cross by having an extra speed boost. The next part of the level is in a cave with even more ropes to climb. There are also parts where Wario can throw enemies at rocks to let water escape from behind it and fill large gaps. Later, Wario will meet the caged Merfle. When freeing him, an alarm will go off and Wario will have to run to the beginning of the level to escape. Arudegara no taki From "Niagara" Falls. Also nai is for "not to be" and aru for "to be". This page was last edited on January 16, 2019, at 09:03.